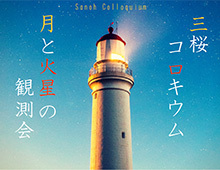 In-house Lectures | Sanoh Industrial Co., Ltd.
Sanoh invites experts in various fields from inside and outside the company to hold lectures under the title of Sanoh Colloquim to support self-development. The lectures are easy-to-understand even for beginners with no prior knowledge. There are also opportunities to experience astronomical observation and zazen (seated Zen meditation). The employees who have participated in these lectures say that they have deepened their knowledge while having fun. Sanoh will continue to plan and run events that allow our employees to come into contact with fields different to their daily work to broaden their knowledge in the future. We introduce the content of the lectures given below. No.1 How Have Humans Come to Perceive the Universe? 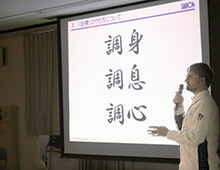 Taku Takeuchi, Sanoh Industrial Co., Ltd.
Dmitrii Shemenkov, Sanoh Industrial Co., Ltd.